I would describe this book as a professor's collection of undergraduate-level lectures about the Dark Ages - which, as he correctly points out, weren't quite as "dark" as the general public might think. Of course, John & Jane Q. Public don't often consider the Dark Ages except when they're watching scurrilous TV shows or movies, and then, do they care? 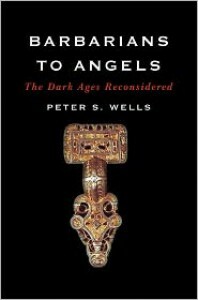 Among the cognoscenti of amateur and professional Late Antiquity/Early Medieval historians, Wells is not exactly breaking new ground. Among this collection of lectures, he does present some interesting information about the evidence for trade and culture and wealth that refutes the hoary notion of howling barbarians, burning cities, ravished populations and empty landscapes. If I had come across this book in high school or early in college, I'd probably be more excited about it. As it is, I've read this before and at much greater and incisive depth (Goffart's Barbarian Tides and Whittaker's Frontiers of the Roman Empire immediately come to mind).